For many years I have battled garden pests. I sprayed and eradicated the Japanese beetles. When deer decided to make an unfriendly visit I installed a 7 foot high fence, a challenge for even the most athletic high jumpers. Frustrated, the family of deer retreated to the woods and foraged on berries. Yes, protecting a garden lies within the provenance of gardeners and I was usually victorious–––with one exception. It was early October, too early for a hard frost in the Adirondacks. Usually. But Ted dropped off the news when he delivered the mail on a day when winter storm clouds gathered over First Brother Mountain. I minimized Ted’s words. Sometimes he was one of those individuals who believe in the slogan, “Start worrying. Details to follow.” That night I glanced at the thermometer for one last time before I went to bed. 39° degrees. I could sleep soundly. I woke to a crisp morning, the sun already lifted from the lake, and a temperature of 33°. Not even frost. Certainly not a hard frost. But I forgot that the weather was always slightly warmer lakeside than at the farm across the road. Calmly, I walked up to the farm carrying my woven reed farmer’s basket from the market in Provence. There should still be yellow cherry tomatoes, green peppers and a row of pink cosmos to be cut for a final bouquet. But, as I approached the garden, I noticed on the hill in front of the red chicken coop a blanket of white. Frost. My spirits fell. Only the pumpkins had survived. The frost was on the pumpkins but they would still offer a plentiful harvest for pumpkin pie, and sugar pumpkins for the grandchildren to carve. 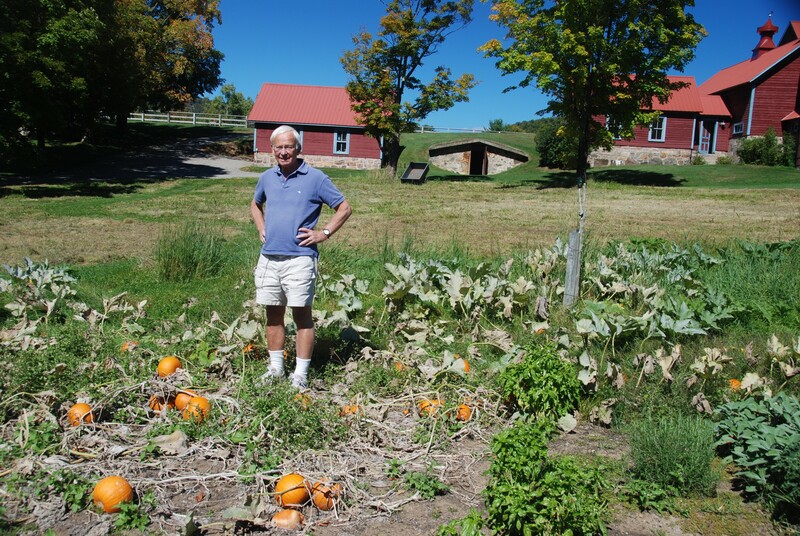 It would have been nice to pick fresh vegetables but the pumpkins––– well, that was sufficient. Then, as a bevy of geese flew overhead, escaping the approaching winter, I wondered why only the pumpkins survived. However, I knew there was not an answer to my query. Men and women cannot control what, or who, shall live and who shall die. Life is often a journey along a precipitous abyss, but although we are powerless to influence time, we can live the years granted to us richly and fully. And, hopefully, survive the hard frost. October 23, 2016 in Brant Lake.